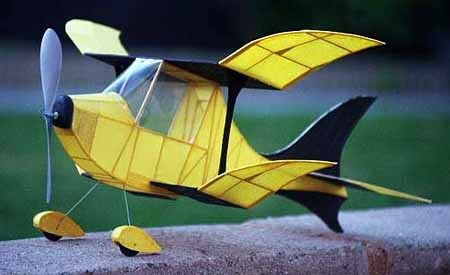 "This unusual biplane was designed by fellow FFML member Curt Haskell, and is quite a good flyer despite its unusual appearance. The first time I took it out to the Sepulveda basin where I fly, pretty much everyone came over to take a look -- a few even snapped some pictures. In terms of construction notes, here are a few thoughts. Construction is actually pretty basic. The fuselage is a standard box with a couple half formers up front to give it a rounded nose area. There is, needless to say, a lot of lamination required. I used two strips of 1/16" X 1/32" on all the curved areas. All interior sticks are 1/16" X 1/16". I use white glue, rather than CA, to laminate. Curt's plan is terrific. I only made two modifications, and one of those turned out to be wrong. My major change was to build the wing using cracked ribs rather than the full size ribs shown in the plan. I just didn't feel like cutting out ribs. No other reason. The one change I shouldn't have made was in building in a touch of down thrust. I ended up shimming up the nose block to where it was in Curt's plan. This is the only plane I own than needs absolutely no down or right thrust. Had I built it exactly to plan, I wouldn't have needed to do any flight trimming. Although not really a change, I also glued about three dozen gussets into the fuselage to give it added strength. Three dozen is probably a bit overkill, but I tend to be a bit fanatical about those little triangles, especially after Kelcy told me that he snapped the fuselage of his Whimsey during either a winding or flying accident. Covering is with (don't read this you purists) Hallmark tissue, attached with diluted white glue and sealed with wife-approved diluted white glue as well. The plane has around a 16" or 17" wingspan, weight is around 20 grams. Whimsey flies on a single loop or 3/16" rubber. The prop shown is a 6" Peck, although I recently changed to a 7", which has made it fly a bit slower. I'm thinking of trying an 8" or 9" prop in the near future since it seems to handle the torque with no problems. With around 700 or 800 winds (the most I've put in so far), the Whimsey does around 30 seconds in a nice wide circle. The plane climbs really well during the initial power burst, getting up to around 50 feet before leveling off. It sure makes me want to print a set of plans and start right in! And an update. The Whimsey finally sifted its way to the top of my building list in the spring of 2016. Click here for more details.